Today’s post will be very straightforward and workman-like, as today I have to finish up a magazine article and my parents are having their annual holiday cocktail for a group of friends, so we will be busy all day! It suits, however, because for all the vibrant color and flavor of the result, this is one of our everyday, workman-like meals. Pollo entomatado is a go-to easy after-work thing.We love it over here and try to make extra for the following day’s lunch. 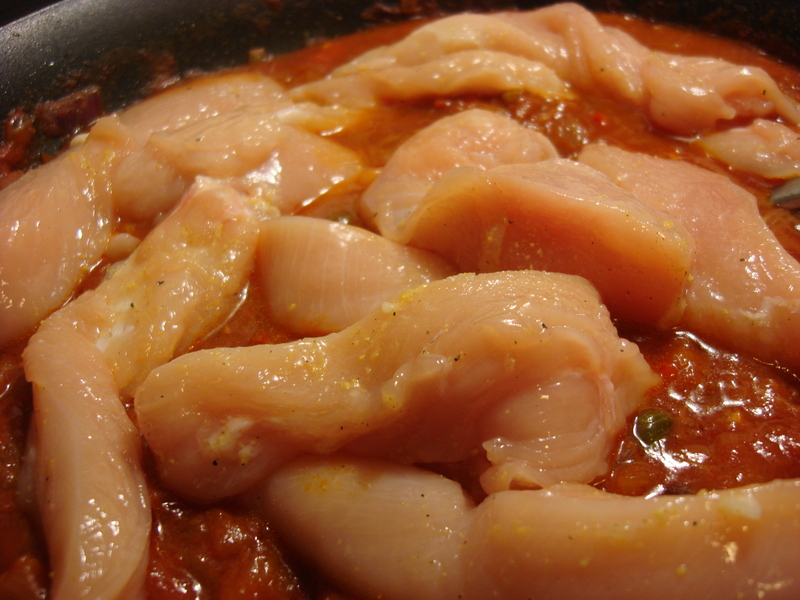 While it’s admittedly easier just to throw a couple of chicken breasts into a pan and fry them, with just a little more chopping and sauteing, you can have a dish that is much more flavorful and interesting. The sauce helps stretch the meal, as everyone will want more rice to mix into the sauce (if your family is that way, add a bit more water to the sauce to stretch it!). It makes for nice leftovers too! This will also give you a nice creole flavor without having to search for some of the harder-to-find herbs. 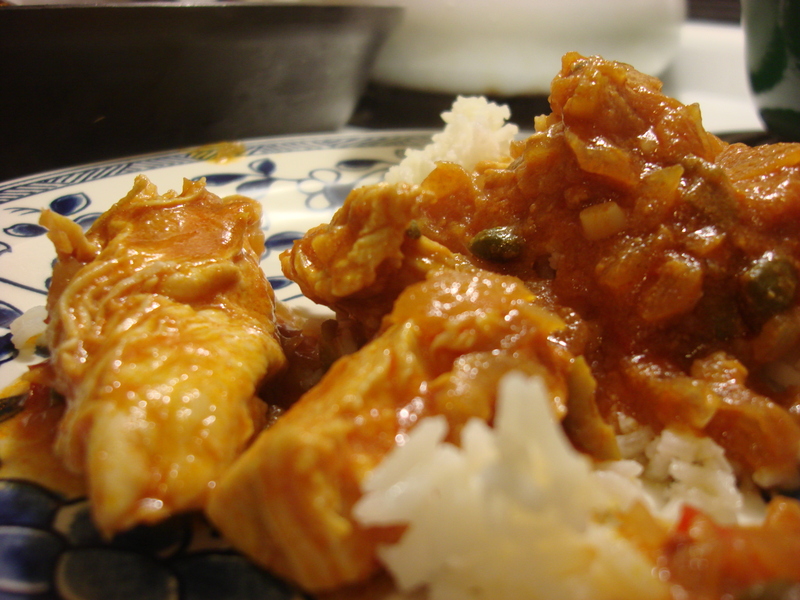 Chicken in spicy creole sauce is one of Leandro’s favorites. Heat olive oil in a large skillet at medium high until liquid and fragrant. Add onions, stir to coat, and lower heat to medium. After five minutes, add garlic and peppers and pepper flakes, if desired. Cook an additional 5 minutes, until vegetables are tender, then add tomato sauce, olives and capers and cook at a lively simmer for 10 minutes. If using tomato paste, add water by the tablespoon until it has reached desired liquid consistency. This should be a thick sauce. Meanwhile, pound the chicken breasts to ½ thickness and cut into strips –against the grain — or cubes, if desired, or left whole. Sprinkle with a pinch or two of salt. Place olive oil in a medium pot (with a tight lid). Begin heating to high while adding the rice. Stir to coat, Add water and salt. Stir once, then bring to a boil. Lower heat to medium and allow water to evaporate until it goes below the surface of the rice and there are a couple of holes in the surface. Turn rice over once with a big spoon. Cover and cook on low another ten minutes. Fluff with a fork and serve. Natalia, this looks delicious! I will have to try soon. Thanks for sharing. Love the blog!! Thanks so much! I hope you enjoy it as much as we do over here…buen provecho! Oh I bet those are so tender. Great recipe!